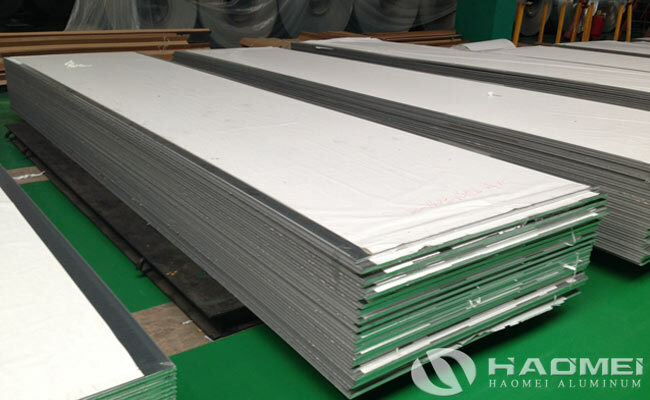 China 6082 aluminum sheet belongs to 6000 series Al-Mg-Si alloy, it is a heat-resistant and reinforced aluminum alloy plate with medium strength, good welding performance and corrosion resistance. 6082 aluminum alloy is mainly used in transportation and structural engineering industries, such as bridges, cranes, roof structures, transport planes, transport ships, etc. 6082 aluminum sheet has many wide usage in USA and Europe, especially in aerospace and automotive industry. So the demand of 6082 aluminum is very large in 6000 aluminum, only behind of 6061 aluminum alloy. 6082 aluminum sheet belongs to hard aluminum alloy and wrought aluminum alloy from the composition, 6082 aluminum alloy has good machinability, good contact welding, spot welding and seam welding, arc welding and poor gas welding performance, it can strengthen by heat treatment, the extrusion effect is suitable for places with high strength, hardness and temperature requirements. The O and T4 tempers of 6082 aluminum alloy are suitable for bending and forming applications. The T5 and T6 tempers of 6082 aluminum alloy are suitable for good machinability applications. China 6082 aluminum sheet generally have good processing characteristics and good anode reaction properties, so they are widely used in mechanical parts, forgings, commercial vehicles, railway structural parts, shipbuilding, etc.